Seven of the country’s finest theater artists are set to join forces on September 1 for PHILSTAGE’s fundraiser. Entitled “Mundong Entablado”, the show is part of the One Night Stand monthly cabaret at 12 Monkeys Music Hall, and features songs from eleven contemporary Filipino musicals. Theater veterans Bituin Escalante, Cris Villonco, Sweet Plantado, Nonie Buencamino, and OJ Mariano take the stage with rising stars Kim Molina and Sandino Martin in this unique celebration of Manila’s vibrant performing arts scene. Under the direction of Topper Fabregas and musical direction of Ejay Yatco, the program consists of songs from Rock Supremo, Zsa Zsa Zaturnnah, Bituing Walang Ningning, Lorenzo, Noli Me Tangere, El Filibusterismo, Maxie the Musical, Kung Paano Ako Naging Leading Lady, Sa Wakas, Rizal X, Isang Panaginip na Fili, and Rak of Aegis, all re-arranged for this cabaret. Proceeds of the event will help fund PHILSTAGE’s projects such as theatre workshops, master classes, and the annual Gawad Buhay! Awards. Founded in 1997, the Philippine Legitimate Stage Artists Group (PHILSTAGE) is the country’s only organization of professional performing arts companies. Member companies include 9 Works Theatrical, Actor’s Actors Inc. (AAI), Ballet Manila (BM), Ballet Philippines (BP), Full House Resorts World Manila, Gantimpala Theater Foundation (GTF), Philippine Ballet Theater (PBT), Philippine Educational Theater Association (PETA), Philippine Opera Company (POC), Red Turnip Theater, Repertory Philippines, Tanghalang Pilipino (TP), Triumphant People’s Evangelistic Theater Society (Trumpets). “Mundong Entablado” will be on September 1, 2015, 9:00PM at 12 Monkeys Music Hall, located at Century City Mall, Kalayaan Avenue, Makati City. 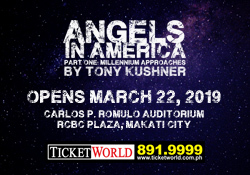 Tickets are priced at Php 1000, and may be purchased through any of the PHILSTAGE companies or at the venue. Previous Broadway Open Mic is back!